43 Lancaster Gate, London, W2 3NA, UK. You are welcome to attend the Africa Day celebration next Sunday from 5.00 pm. We will be having a mix of traditional dress (Please wear your traditional national dress if you are part of the African diaspora. ), music, poetry and the highlighting of serious issues that require our support and action. To commemorate the creation of the Africa Union (previously the Organisation of African Unity). UPF International often holds events in partnership with the African Union in New York to commemorate this day. For example Africa Day 2013 Manhattan with Dr Ban, Ki-moon. He is a civil engineer, politician and human rights activist. 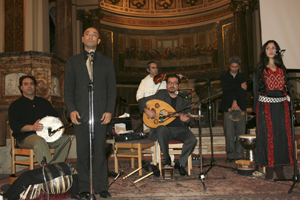 He is a respected Libyan dissident from the city of Misurata and a Libyan affairs specialist. He is the founder of the Libyan Freedom & Democracy Campaign. This political campaign has been a catalyst in igniting the 17th of February Libyan revolution on the virtual world. However, the Libyan Freedom & Democracy Campaign as a civil society movement has given birth on the 14Th of July 2011 to the first political party in Libya following the outbreak of the Libyan revolution. It is called the Democratic Party. It is the only secular political party. It is actively calling for the establishment of a secular democracy in Libya with the direct political help of the UN. Concluding with a film about Child Soldiers and Conflict Minerals. The Universal Peace Federation-UK is planning to commemorate African Day (usually May 25th each year) early on Monday April 26th at 6:30 for 7:00 pm, to coincide with the expected election campaign period to focus on the United Kingdom’s relationship with Africa. We will consider the trading relationship between Africa nations and the UK and how effectively the UK is supporting African development. All major political parties have pledged to spend 0.007% of Gross National Income for overseas development aid. We will be asking representatives of the three major parties to explain their policies ahead of the UK general elections. There will be a discussion of those manifesto promises with influential Africans and civil society involved in African development. Cllr. Lurline Champagnie will also address the audience regarding a charitable project, Reach Out Africa, she has initiated. 6:30 for 7:00 pm, at 43 Lancaster Gate, London W2 3NA. Representatives of other parties have been invited. Please let us know if you are planning to come. This is a public meeting, open to all concerned about Africa. 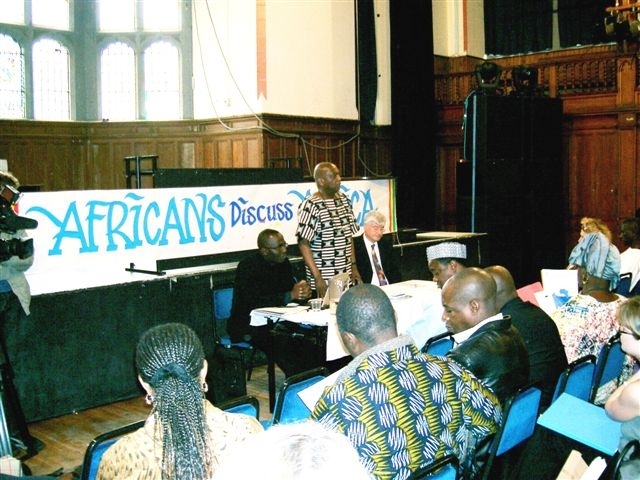 The photo above is of the UPF event ‘Africans Discuss Africa’, in Edinburg at the time of the G8 Summit in Glenneagles, June 6th 2005. Global Vision 2000 and the Universal Peace Federation jointly organised, on July 13th, an emergency seminar in a parliamentary Committee room to examine the underlying causes of the financial and economic crisis and the need for a fundamental paradigm shift to restore stability, prosperity, justice and peace. The seminar shed light on the terrifying nature of the death spiral of the global debt based financial and economic system and the ruinous path towards servitude and serfdom. There were parliamentary, interfaith, monetary and fiscal reform perspectives shared and brought to bear on terms of alternative radical holistic solutions offering suffering humanity hope and salvation. This event took place when Parliament is at it’s lowest ebb and it’s image has been tarnished. The event affirmed grassroot coalitions facing the urgent need for civic society to champion the values of public service and the common good and claim Westminster as the people’s shared political space. Speakers gave clear evidence of the ‘grand canyon’ between officials who imagine green shoots of recovery and the common experiences in our communities. The financial crisis has revealed an economic crisis now manifesting as a full blown political crisis. Participants agreed that the future is viewed with fear rather than hope and the hatred of the stranger stalks the land. We are now seeing the rise of political extremism which threatens the peace and unity of the country. We deplored the way mainstream media and political elite are taking remedial action but failing abjectly to address the underlying forces. There is a need to review and redesign a fairer, just and sustainable global economic system that empowers the world’s poorest billion to emerge from desperate poverty and facilitate global peace; helping both wealthy and poor to lead full and healthy lives. In offering different proposals for change this seminar moved us all in the direction of a socially and ethically based mind-set , a new paradigm and the nature of the system that could implement it. Are we witnessing a ‘L shaped’ Great Depression rather than a ‘V shaped recession’? Do we need regulation, reform or revolution? How can monetary, fiscal and economic justice advocates connect with the people and political system? How can people power and national sovereignty be secured against the global financial oligarchy? How can the UK deliver on it’s commitments on MDG? What does the City of London need to do to be the leader in global finance? Is Islamic finance a Trojan horse or Panacea? What type of paradigm shift is required? Co-convenor Robin Marsh Secretary General, Universal Peace Federation UK – welcomed us with a plea to bear in mind the intensity and ubiquity of suffering around the globe. Co-convenor Moeen Yaseen Managing Director Global Vision 2000 – – emphasised the challenge before us as outlined with such clarity in the press release summarised above. Lord King, as host for the seminar, reminded us of the detail of our distorted economies, nationally and globally, and pressed us to attend to the proposals to be offered to meet the challenge we face. Lord Ahmed wished the seminar well and underlined the urgency of our getting the message of moneytary and fiscal reform across to Parliamentarians. Kelvin Hopkins MP, spelt out the almost total loss of a vision of inclusive justice and the cost of not restoring a moral base to political economy. Anne Belsey: Monetary Reform Party, took us to the grass roots task of communication, illustrating, from her own diligence in the work of the Money Reform Party, the fundamental issue of talking in our communities, with a clear, succinct message, of the need and the process for money reform, as a basic contribution to generating the critical mass we must build to seek effective change. Daud Pidcock: Global Vision 2000 –brandishing ‘The Crash of 2008’ a revisiting today of a study of ‘people versus the banks’ by Swann, he spoke as a scholar long probing the history of the abuse of money [‘lethal tender’!] as a driver of the disintegration of society, presented evidence we cannot ignore of the need and difficulty of restoring state transparent responsibility for the money supply. ‘We’ve endured iron, stone and the lash, but the hardest to endure is debt’ We must restore the effect of the Jubilee practised for 2 1/2 thousand years 2500 BC in Babylonia; explode the myth of the Bank of England being a nationalised bank; expand the M0 supply for community ends. David Triggs, Coalition for Economic Justice and Executive chair, Henry George Foundation, informed us eloquently and passionately of the need for genuine capture and distribution of the accumulated value of land springing from our co-operative activities over time. He stressed the need to rediscover the natural law that governs the prospects of all life on earth as the basis for our paradigm shift of ordinate significance and to translate this into the economic means of collecting the community’s value for the community, combating the erosion of justice by grossly distorted property rights. Fight against nature and it will punish you. Work in harmony and it will reward. Water runs down hill!. Such a fact cannot be fought or legislated against; it just is. Economics, the production and distribution of wealth for all is intimately part of nature and thrives only by its rules. Dr. Adrian Wrigley, Systemic Fiscal Reform Group, emphasised the systemic nature of economic disorder and the systemic response we need to make. He contrasted the countries where revenue was based in the collection and fair distribution of community value with those that taxed people’s productiveness, the former producing more just and stable societies. The old paradigm of ‘absolute resource ownership’ must give way to the new mindset that could be triggered by a’ debt for tax’ swop. Land must be restored to the factors of economic productiveness and the great monopolies [land, water, intellectual property etc.] ended. He explored the history of economic society through the ages and found we had known the solution for millennia. Tax and regulation are smokescreens. What matters is the funding source, that of the largest monopolies, land and money. Avoid this melancholy proof and expect inevitable meltdown. Scholars back to Confucious are unanimous on free access to nature’s gifts unless that access causes harm or exclusion through exploitation or exponential extraction, in which case the victim must be compensated. Civilisation flourishes under these conditions. The paradigm under which presently we suffer took over at the beginning of the 20th century when nature was cut out of the analysis. We don’t need a new paradigm, we need to re-instate the old one. Leaders need to read history and start thinking deeply and stop rebutting the well informed public. Free market capitalism is the best approach but of the Eastern not Western variety! Dr. Nafeez Ahmed: Director, Institute for Policy Research and Development, Provided further scholarly evidence of the fundamental change of perception required if we are to replace exploitative structures with those creating inclusive justice. New structures founded on only productiveness, not speculation; on the ending of wage slavery, and the interest free funding sustainable growth must be designed. Ian Parker-Joseph: Leader, Libertarian Party, (click for full text) explored the creative tension to be found between a global consciousness of our interdependence and the nurture in freedom of the rich diversity of local communities. He recommended the interplay of 1] £Sterling – debt free money for societal infrastructure-2] £Sovereign as 100% backed trading currency, and 3] Free banking in competition. Global Vision 2000 is an independent international Islamic think tank committed to the evolution of global humanity. The UPF Peace Council was held last Saturday on July 4th in order to gather together branches and committees of UPF across the UK. It was useful to promote the work of committees to those activists in parts of the UK where is less activity. It was also useful to identify new areas in which there is interest to develop UPF activities. Reports from UPF Committee Chairs or active representatives. 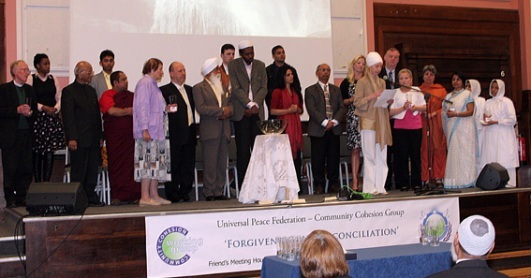 The Community Cohesion Group announced events such as a Forgiveness and Reconciliation Festival on October 4th, an event to commemorate ‘Black History Month’ in September and a Holocaust Day event in late January 2010. Dr Marios Gerogiokas announced a series of conferences and discussions with experts to consider the issues surrounding Climate Change negotiations culminating in Copenhagen in December 2009. These include a talk by Dr. Yacob Mulugetta from Surrey University on Understanding Food, Water and the Energy Crisis on July 16th and a talk by Lawrence Bloom on September 3rd evening both at 43 Lancaster Gate. Marriage and Family Committee Chair, Eddie Hartley, highlighted the upcoming conference on the 18th of July,Commitment in Marriage: What the Faith Traditions Offer Modern-Day Britain held together with the Women’s Federation for World Peace.He also reported on the UN International Day of the Family event held on May 15th. Birmingham UPF – Dr David Earle explained the progress being made in Birmingham with the local Council in partnership with Women’s Federation for World Peace run locally by his wife, Patricia. Dr Satwant Multani, the Chair of Central Scotland Interfaith, spoke of the Interfaith Youth Hostel project and the inspiration he had received from Paul Curries 1000 mile walk. He had raised £1000 for the Interfaith Youth Hostel among the members of his Gurdwara. A quick collection from the audience raised a further £180 for the project. I was reading a UN press release today about The UN Conference on the World Financial and Economic Crisis and its Impact on Development when amid all the professional language one sentence seemed to stand up and scream at me. We in the UK may have problems but…. Together with Global Vision 2000 we are having an event in the House of Lords (link to invitation) on the 13th of July to look at alternative methods to run an economy. The UPF Peace Council on July 4th (link to invitation) will also look at current campaigns of other groups that are experience in these issues. Over the last decade, there have been massive gains in reducing global poverty yet there are some big threats as we leave a strong era of global economic growth. The global financial crisis is bringing the most significant economic downturn for decades which could devastate the developing world as 90 million more people are forced into poverty at the end of the year. The effects of climate change are increasingly apparent and conflict as well as weak government is preventing progress for millions of people. The global economic crisis has also revealed a number of flaws in the international system. The Department for International Development will be producing a new White Paper this summer which will outline how the government can tackle global poverty in the context of these long term challenges. The UK Government believes that helping the poor is not only a moral imperative, but in our increasingly interdependent world, it is in our long-term interests. It is an essential element of our international policy that enables the UK to be a successful world leader and a strong force for good. Later this year DFID will publish a new White Paper on International Development setting out how the UK Government aims to continue helping deliver better lives for the world’s poorest and most vulnerable people. A world shocked by recent global events and more connected than ever before means new approaches are required for the challenges we now face in pursuit of our mission. Despite these adverse events of seismic proportion and consequence, we must acknowledge the remarkable progress in reducing world poverty over the last decade. In the UK, we can be proud of our collective contribution to this success, across Government, NGOs, faith groups, trade unions, private sector and many others. The three previous White Papers (1997, 2000 and 2006) have provided the UK with a clear focus on eliminating poverty, and have helped ensure that the UK plays a key role in lifting 3 million people out of poverty every year. Fighting global poverty and achieving the Millennium Development Goals will continue to be at the heart of our mission. We must continue our work on core areas such as getting more children to school, tackling HIV/AIDS and malaria, and continuing to put gender equality at the heart of our agenda. But we also need to recalibrate elements of our agenda to deal with the changed circumstances which now prevail. This consultation document sets the current context and then outlines some preliminary ideas and poses a series of questions on four priority areas. I encourage all concerned to respond to these questions. We also welcome comments on how we can further refine our existing agenda, for example on supporting basic services such as health and education. The Government relies on your contributions of experience, knowledge and wisdom as key inputs to its policy formulation. I very much look forward to your responses. Please send your comments by Wednesday 27th May 2009 to whitepaper@dfid.gov.uk or by post to White Paper Team, DFID, 1 Palace Street, London SW1E 5HE. The dust has settled on last week’s G20 summit, and it’s time to ask: did world leaders Put People First? Our verdict: it was high on rhetoric, and high on headline figures, but overall the G20 failed to deliver the radical changes that are desperately needed. But despite these setbacks, the G20 summit is not the end of the story. As one placard had it at the G20 protest, ‘The beginning is nigh’. World leaders may still be stuck in their old way of thinking, but we’ve started a global discussion about how to transform the financial system to replace 30 years of discredited economic thinking. That discussion will continue in the months ahead. In June, the United Nations will host a major meeting on the financial crisis. The G20 leaders have said they will meet again in six months time, and the G20 Finance Ministers are due to meet in Scotland in the autumn. This crisis is still a massive opportunity to clean up global finance. But it’s going to take continued and determined campaigning throughout 2009, and beyond, to make that happen. If there is to be lasting change, the G-20 must acknowledge that the current financial crisis did not happen by accident, and it was by no means inevitable. The root cause of the problem has as much to do with moral, indeed spiritual failure, as governmental or financial mismanagement. For this reason, improved fiscal, economic and trade policies alone are not enough. The attitudes and behaviour of people, institutions and even entire nations must change. This was a good opportunity to highlight important issues regarding fairness, relieving poverty, injustice and climate change. Among the 35,000 people involved there were a wide ranging number of groups included in the demonstration. Where else could you share a walk with ‘Bananas for Justice’ who were emphasising fair trade issues and a paper mache dragon that was promoting the World Development Movement? The demo was preceded by a church service led by the Bishop of London, the Rt. Rev. Richard Chartres in Westminster Central Hall. For much of the march from Westminster to Hyde Park I was helping to carry the Jubilee Debt Campaign banner or placards. We were following a group including one with a Mohican haircut and another with bright pink hair who took turns to power a speaker system through bicycle power and chanted or sang in a way that was well practiced and humourous. The speakers promoted issues of fairness and justice not just within the financial system but throughout our entire human family. Those on stage or on video repeatedly illustrated the injustice of the current economic and trading system. Rather than the G20 being the goal and end of the campaign the feeling from speakers and activists was that this is only one step in a long campaign to rectify the current unfairness. The current crisis was repeatedly referred to by participants and speakers as a watershed that is provoking reflection and must not be followed by ‘business as usual’.